In this post I am going to share with you one of the topmost secret of success in Oriflame (or for that matter in any field of life.) 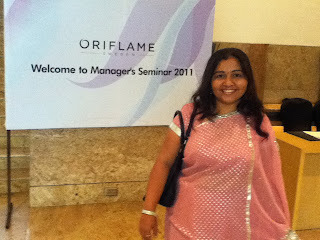 I have trained hundreds of Oriflame consultants in the last 8 years. Many people in my team are now at Manager, Senior Manager, Director level and above. When I see my the people who are doing the Oriflame business successfully, I see that there is a common element. I have noticed that people become successful because they have a ability to think big. And people who think big are bound to do very good. People who think big, want to know 'how to become a manager in Oriflame' and then reach higher levels like senior manager and director. I guide them accordingly. When I tell them that you can become a manager in Oriflame they don't doubt themselves. They tell me, "why not? I will do it. Tell me what do I have to do?" They are ready to be coached and willing to learn the process by which an Oriflame consultant becomes a Manager. Those who think big believe in themselves. We can see themselves as a Manager. When you believe that you can do it, then you can turn any dream into reality. The losers think what if I fail and the winners think what if I succeed? Just by changing your thinking you can change your beliefs and your reality. When you believe that you can become a manager your mind will find a way to do it. When you believe it's possible your mind goes to work to make it possible. By transforming your mind you can transform your life. When you believe in yourself and think positive you can turn challenges into opportunities. If you surround yourself with people who believe in themselves you will also start believing in yourself. Some of the best people you can associate with are your up line leaders who are already successful in Oriflame. They can guide you the best because they know how it works and how to get success in Oriflame. You can accomplish whatever you think of. When you talk to yourself, do you talk positive and do you motivate yourself or you talk down to yourself? You have to be very aware of your self talk. It can make or break you. Banish all the negative thoughts with reason and logic. Take stock of environment and see who is lifting you up and who is putting you down. When We Think Big, We Become Big. When we visualize the big future our mind starts to work to make our wildest dream into reality. Our mind works in this way. We should always think big. Create within yourself a belief that you can do it. Believe that you can become a manager. Believe that you can become a Senior Manager and Director someday. Belief is the thing that differentiates successful people from unsuccessful people. Watch the People who are successful do what they are doing. This formula for success. When you believe in yourself you can over come any challenge. Because your mind will trigger thoughts and ideas to solve the problem. Ultimately you will come up with a way to overcome problem. Your positive self talk will help you when you are in a fearful situation or when there is a setback. Positive self talk will help you to come out of this and seek opportunities for growth and development. Successful people don't allow setbacks and fears to stop themselves. Everyone has their share of setbacks in life. You have to break through the fear by reminding yourself of your strengths. One of the best things you can do to remove the fear is take action. Do the thing you fear and the fear will disappear. Action brings you out of the problem. Catch yourself when you are giving excuses to yourself. Successful people do not give excuse to themselves or others. With the right attitude you can come out of any problem and even achieve challenging goals. Think big and inspired positive thoughts in others. Don't sell yourself short do not convince yourself that you are not born to be great. Because you are born to be successful. Think about your greatest assets or qualities. List all the qualities, strengths and skills you have and remind yourself of them whenever you want to motivate yourself. Positive language creates a positive picture in your mind. Always be optimistic and use positive words. Your brain starts to work the moment you say something. When you think big your language will be positive and your brain will work to accomplish the thing you have in mind. People who think positive see the glass is half full not half empty. There is an opportunity hidden in every challenge. Every problem is an opportunity to use your creativity to grow fast. When you have a never give up attitude you are helping everyone in your team to be like you. Your actions and positive words have an encouraging and motivating effect on them. Failure is an opportunity to develop yourself. You can learn from every experience because failure is never final. You just need to do it with a different approach and success is yours. Study successful people and see how they do it. If they can do it, you can also do it. I am sure that you have been through times when you had a challenging situation in life or experienced a setback and you over came it. The fact that you are still alive and reading this means that you have bounce back many times. You learned from the mistakes and got success in that activity or goal. Treat yourself as a precious person. How you think about yourself will determine how you act and that will determine how others react to you. Believe and act that you are precious person. Just like you are precious, other people are also precious. When you treat them with such respect, they will love you. Write some good points about yourself in your diary. Do some positive self talk everyday. Read some positive affirmations everyday. Be in a positive environment. 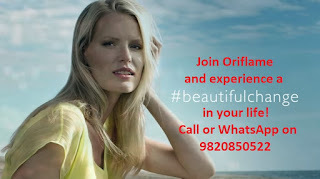 Talk to someone who is really positive and who is successful in Oriflame. Imagine how you want your life to be then take steps in that direction. Set goals in all aspects of your life. Short term goals and long term goals keeps our eyes on the price. Give us energy. What you read, the TV serials that you watch, the people you meet, the people you talk to on phone, or chat with on WhatsApp, have an influence on your mind. Negative People who give excuses all the time, have a negative influence on our mind. Stay away from people who put you down and tell you that you are not capable. Don't get influenced by their thinking. Don't accept their thinking and programming. Stay away from them because they can stop you from dreaming big and thinking big and acting big. Surround yourself with successful people. Talk to people was successful every single day and learn from them. Be enthusiastic and do everything with excitement. Have a positive tone and body language. Put life in everything that you do. 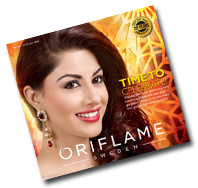 Be enthusiastic when you share about Oriflame products Oriflame offers Oriflame opportunity. Act enthusiastic and you will feel enthusiast. When you talk to others, start with a good news. Take every opportunity to give good news. Focus on the good. Genuinely give compliment to other people. Make their day. Be generous with praise. Make people happy and make them feel good about themselves. They will love to be around you when you do that. Always be in Action and visualize your goals. Implement your ideas quickly. Excellent ideas count only when you act upon them so always be in action to achieve your goals. Set goals for yourself every month. Write down your plan to achieve that goal. Visualize your successful future everyday. What is important is where you want to go. Your goals are important. There is no perfect time to implement a big idea, just do it. We always start with an idea because thoughts are the blueprint of success. When we visualize our goals it means that we are ready to actualize them. Every night you must spend some time in visualizing your future. Don't doubt that you will achieve the goal or not. Just decide that you will do it and solve the problems that come on the way. Make mistakes and learn from them mistakes to grow fast. Don't try to be a perfectionist. And don't fear doing something wrong. Just do it the way you know to do it. With time you will get better and better. Act with compassion and empathy. Recognize people for their achievement. Appreciate people for their qualities. To understand other people get into their shoes. You can earn respect by be giving respect to others. Every person is able to achieve great things. Some people may not be able to realize their own greatness and capability. You have to make them realize their capability. Never give up on other people. Every person is capable of doing great things if you just encourage them enough. If you believe in them they will start believing in them self. Observe the routine of successful people. Notice your body language and the world they use. Ask for tips and experiment with them. Your upline leaders are a source of power. Be connected with them on a daily basis as frequently as possible. When negative people in your downline pull you down, call you up line and get empowered. Constantly nature and empower your mind. Keep learning new things. Be around people who are happy and you will become happy. Be around people who are successful, and you will become successful.